Ace Attorney Investigations: Miles Edgeworth is a unique adventure game by Capcom. The player takes on the role of famed prosecutor Miles Edgeworth, a memorable rival of charismatic legal eagle Phoenix Wright. 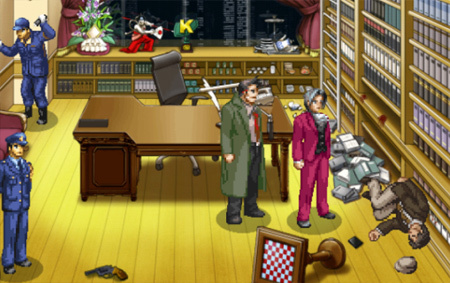 Edgeworth actively investigates crime scenes in order to pursue the truth behind each case. By solving the challenging puzzles presented him, Edgeworth will work with the police to bring criminals to justice. Guide Miles Edgeworth through various locations, examine and analyze clues, work directly with characters on the scene, find contradictions in suspect statements, and get to the truth by presenting decisive evidence. The game features high resolution graphics optimized for modern devices. Experience the famously eclectic cast of characters of the Ace Attorney universe. If you get stuck in the game, check out the video walkthrough and gameplay for the game. This entry was posted in Android Games, iOS Games, Mobile Games, Walkthrough and tagged Ace Attorney Investigations: Miles Edgeworth Cheats, Ace Attorney Investigations: Miles Edgeworth Gameplay, Ace Attorney Investigations: Miles Edgeworth Guide, Ace Attorney Investigations: Miles Edgeworth Hints, Ace Attorney Investigations: Miles Edgeworth Review, Ace Attorney Investigations: Miles Edgeworth Solutions, Ace Attorney Investigations: Miles Edgeworth Strategy, Ace Attorney Investigations: Miles Edgeworth Tips, Ace Attorney Investigations: Miles Edgeworth Walkthrough by Marvin. Bookmark the permalink.